Easter Season… To Feast or To Fast? Home Chef's Corner Easter Season… To Feast or To Fast? What’s more recognized as the week of Celebrating Easter in the western world is known as Holy Week in the Philippines. For most believers, it is also known as the Lenten Season. It is a season for spiritual cleansing, and you bet, other than seeking for spiritual healing, it is absolutely the time for fasting and praying. What is being practiced is what would reflect one’s religious belief, and yes, this is a serious time about recognizing one’s spirituality. Meanwhile, what’s fascinating is that most Filipino-Americans tend to celebrate Easter by following what other cultures do, and that is to have a feast on one of the most celebrated food events on a busy Sunday in most Maui hotels and restaurants, raved to be the Easter Brunch. Displays of lavish international delicacies are showcased on grandiose buffet tables. What’s alarming is that no one is limited on what we can pile on our plates, and how much can we stuff in our bellies. So what is being commemorated? Is it a moment of cleansing or feasting? Well, as for the Philippine customs and traditions, religious beliefs are highly regarded. The week begins on Palm Sunday, and the peak of the occasion are Maundy Thursday, Good Friday, Black Saturday, and Easter Sunday. Throughout the week, it is not recommended to eat meat, so no pork, chicken, or beef as suggested. Harvests from the ocean’s bounty, and seasonal fresh vegetables are favored at this time of the year. Growing up from the central plains of the country where rice is cultivated as the number one crop in the region where my family lived in Gerona, Tarlac, I remember vividly how my mother Soledad and my aunt Dolores would plan for the festive occasion with lots of food, but my attention would particularly be drawn to a glutinous rice cake known as the “Suman Bulag.” I wasn’t quite sure how it got its name, but I know the word Bulag means “Blind”. 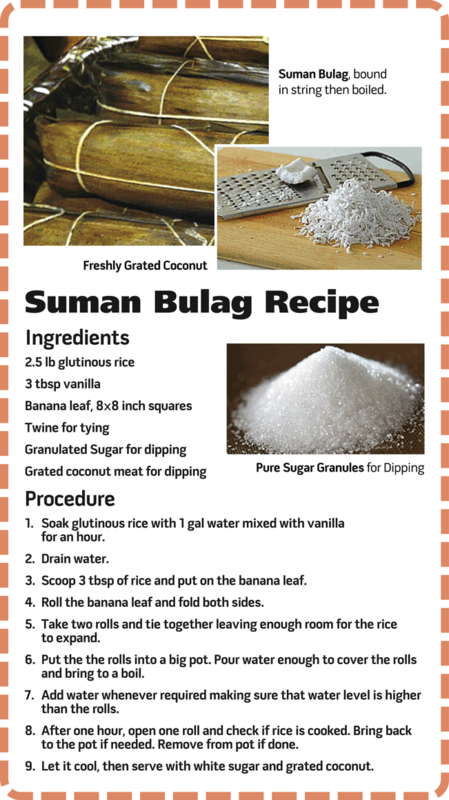 Until recently, while conversing with my Mom, brother and my sister, I learned that it was named Suman Bulag because of the fact that it is so easy to make, that anyone can do it blindfolded. This delectable rice cake wrapped in banana leaf is very enjoyable to eat, as it is paired with two Suman in one. They are bound by a string together, so it’s like buying two for the price of one. Eating it can be a mess, but it doesn’t matter. Dipping every bite with sugar and freshly grated coconut is part of the fun. From time to time, my Mom would still make it on special occasion, and we plan on making it this Easter with my kids. It seems very simple to make, so here is a recipe I am sharing just in case some of you are willing to give it a try and have it as part of your spread this Easter Season. 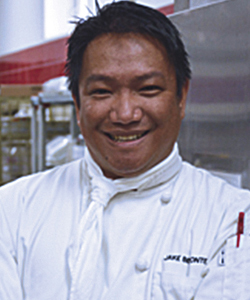 Chef Joaquin ‘Jake’ Belmonte Jr. is an alumni and a Culinary Lecturer at the University of Hawai‘i Maui College, Culinary Arts Program. Chef Jake is also a Maui HS graduate and he has worked extensively in the Food & Beverage operation at Fairmont Kea Lani Resort in Wailea. He currently is the Vice President of the Maui Filipino Chamber of Commerce; Facilitator of Hawai‘i National Great Teachers Seminar; Assistant Scoutmaster of Troop 68; and an active member of the American Culinary Federation. Chef Jake was recognized by the Hawai‘i Hospitality Magazine as one of the 2008 Top 10 Rising Chefs of Hawai‘i Under 40 and was the 2009 Chef Representative of the Hawai‘i Visitor and Convention Bureau’s West Coast Marketing Campaign. Happily married with two children, Mr. Belmonte is also a Small Business Owner and Operator of Maui Lifestyle Healthy Choice, a premier healthy vending company. You may follow his blog or email him at lifestylechefmaui@gmail.com, and connect professionally at linkedin.